The RTV-G-4 Bumper was a sounding rocket built by the United States. It was a combination of the German V-2 rocket and the WAC Corporal sounding rocket and was used to study problems pertaining to two-stage high-speed rockets. Eight rockets were launched during the Bumper program between May 13, 1948, to July 29, 1950. 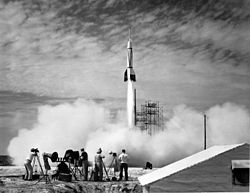 While the first six flights were conducted at the White Sands Missile Range, the seventh launch, Bumper 8 on July 24, 1950, was the first rocket launched from Cape Canaveral. Investigate launching techniques for a two-stage missile and separation of the two stages at high velocity. Conduct limited investigation of high-speed high-altitude phenomena. Attain record-setting velocities and altitudes. Overall responsibility for the Bumper program was given to the General Electric Company and was included in the Hermes project. The Jet Propulsion Laboratory was assigned to perform the theoretical investigations required, design the second stage, and create the basic design of the separation system. The Douglas Aircraft Company was assigned to fabricate the second stage, and do detailed design and fabrication of the special V-2 rocket parts required. Six Bumper launches, as well as other V-2 test launches, were from White Sands Proving Grounds. In 1949, the Joint Long Range Proving Ground was established at Cape Canaveral Air Force Station on the east coast of Florida. The July 24, 1950, Bumper 8 launch was the first of hundreds of launches from "the Cape". Bumper 2 August 19, 1948 White Sands Pad 33 13.4 km (8.3 mi) First stage failed due to propellant flow interruption. Bumper 3 September 30, 1948 White Sands Pad 33 150.3 km (93.4 mi) WAC stage failed. Bumper 4 November 1, 1948 White Sands Pad 33 4.8 km (3.0 mi) Explosion in tail of V-2. Bumper 5 February 24, 1949 White Sands Pad 33 393 km (244 mi) Successful flight. Separation of stages at 32.2 km (20.0 mi). Bumper 6 April 21, 1949 White Sands Pad 33 49.9 km (31.0 mi) Premature V-2 cut-off; WAC stage failed to fire. Bumper 8 July 24, 1950 Cape Canaveral Pad 3 16.1 km (10.0 mi) Low-angle atmospheric flight over 320 km (200 mi) range. First rocket launch from Cape Canaveral. Bumper 7 July 29, 1950 Cape Canaveral 16.1 km (10.0 mi) Low-angle atmospheric flight over 320 km (200 mi) range. ^ "Bumper Project". White Sands History - Fact Sheets and Articles. US Army. Archived from the original on 2008-01-10. Retrieved 2007-12-02. ^ a b "A Brief History of Rocketry". History of Manned Spaceflight. Merritt Island, Florida: Kennedy Space Center. 2000-08-24. Archived from the original on 2009-01-07. Retrieved 2008-10-01. ^ "Biographies of Aerospace Officials and Policymakers, T-Z". NASA History Division. Retrieved 2012-07-01. This page was last edited on 12 April 2019, at 11:30 (UTC).